Today’s sample was grown by Quincy Green, an outdoor and light-deprivation greenhouse operation that’s producing exceptional cannabis in an unused corner of a potato farm just outside Quincy, Washington. Thanks to them and to Ganja Goddess, the SODO retailer who had the goods on hand. I paid $40 for a 3.5 gram package harvested almost twelve months before my purchase (harvest date 11/17/17) and packaged only a month before purchase. That’s eleven months of slow drying and curing for this one. 1. Environmental Stewardship (5 / 5). Sun-grown cannabis, whether produced in full exposure to wind and rain, or enclosed in any style of a protective greenhouse, gets the bulk of its energy straight from the sun – rather than from the earth (and fossil fuels). 2. Freshness (5 / 5). The freshest buds are most often the best. As stated above, the sample was harvested nearly a full year before purchase, so I expected an inferior product – but was very pleasantly surprised. Visual, tactile and olfactory observations all suggested this flower was harvested no more than a month ago. 3. Terpenoids were not quantified, nor qualitatively presented on the Label (0 / 5). 4. Producer failed to list pesticides or claim “No Pesticides Used” on the package label (0 / 5). Inquisitive consumers might visit the grower’s website and find such a claim, but it needs to be stated on the label. 5. Grower has hosted a previous Seattle Bliss tour and inspection (5 / 5). All producers are given benefit of doubt until decided otherwise. This means every grower gets these 5-points until we decide at our sole discretion that the points are not deserved. A brief tour demonstrates compliance with laws and improves consumer confidence. 6. Cannabinoids Labeling, two quantities missing; (3 / 5). The average consumer wants and needs to know Total THC and Total CBD. These totals are calculated values based on the loss of the ‘acid’ stub by shedding CO2, and sure enough Total THC is always just a little bit less than THC + THC-A. Consumers may also care to know how much of each of these active substances were still in the inactive, acid form. The law in Washington requires all four of these to be clearly and accurately quantified. Total Cannabinoids, CBG, CBN, etc., are not required, but may be included on the label as a bonus to the consumer. This label listed “THC: 23.06% CBD: 0%”, which fails to identify whether quantified THC is actual THC, THC-A, or calculated Total THC. 7. Terpene Presence (5 / 5) is evaluated with the First Sniff and is indicative of Concentration as an undetectable sample would rate at 0 and a very strong one at 5. Standard sniff evaluation includes the combined sniffing of the newly opened container AND subsequent grinding of 1 gram and sniffing the freshly-ground product. This step is for evaluating the whole buds in the newly opened container. The glass jar had a second, replaceable seal that preserved the sample well. The first sniff was rich and full of terpenes. 9. Product Color (4 / 5). Dense coverage with amber trichome heads may have caused overall color to appear a brown-leaning 'olive drab'. 10. 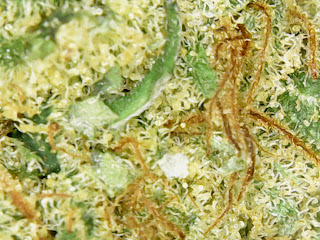 Product Quality is evaluated during bud inspection (5 / 5). Points can be lost for male flower sites (more common recently due to the feminized seed market), insect or animal evidence, abusive handling, etc. 11. Product Moisture is also evaluated during bud inspection (5 / 5). The most ideal buds, this sample inclusive, are sponge-like, mostly dry, but a little bit sticky. The consumer will be able to open a bud, spreading the seedless bracts to reveal and snap the central stem without breaking the bud. No exception here. 13. Trichome Density (5 / 5). Flower is densely covered with capitate trichomes. 14. Harvest Timing (4 / 5). Nearly all glandular heads are amber to dark amber in color, normally indicative of a slightly late harvest (days). 16. Smoke Terpene Presence, 1st, 2nd taste (5 / 5). Sample is rated only upon how fragrant the smoke is; not how well it is liked. This sample was most delicious. 20. Price-Value Rating (PVR), (4 / 5). PVR is calculated based on the price per gram versus the calculated average price regardless of potency. As is the case with this sample, those above the average price earn less. Those equal or under the average get the full five points. This sample earned an overall rating of 81 out of 100 possible points. Outdoor cannabis operations, greenhouse grows and those with light-deprivation greenhouses impose a much smaller carbon footprint on the Earth than indoor operations. This outdoor grower could improve their HigherGround420 rating, comply with existing laws and satisfy the desires of their consumers by making a few changes. The Producer could easily satisfy the consumer’s desire to know exactly what they are consuming by proactively printing an annually verified terpenoid profile on their package label to earn another 5 points. Also, other states have their own requirements, but Washington Liquor and Cannabis Board (LCB) rules state ALL FOUR of the following are required: “THC concentration (delta-9 tetrahydrocannabinol) listed as total THC and activated THC-A and CBD concentration (cannabidiol) listed as total CBD and activated CBD-A” (WSLCB rules, https://apps.leg.wa.gov/wac/default.aspx?cite=314-55-105 WAC Section 2, a, iv, E). NOTE: The rules have errors. Activated THC-A is THC, and activated CBD-A is CBD. When transcribing these values from the lab report onto your label it is best to transcribe each exactly as the lab has it listed. THC is activated THC, THC-A is the non-activated, acid form of THC, and so on with CBD. Not all growers, especially outdoor growers with large harvests to process in just a short few weeks, have their craft ‘dialed-in’ so well. I found this grow to be smooth and delicious. I’d recommend those with any tolerance to check dates and stick with the fresher harvests, but sometimes just getting ‘mellow’ can be quite a pleasure. Today’s sample of Dutch Treat as grown by Sky High Gardens, an INDOOR cannabis farm in Seattle, WA, was very likely harvested near December 24, 2017 as the label indicates “Cure Complete: 1/24/2018” and tested at 26.9% Total Cannabinoids. Evaluated at nearly a full year old, here’s how this delicious bud rated with HigherGround420.com. 1. Environmental Stewardship (0 / 5). Indoor cannabis is pretty, but the electricity required to produce it is very costly. Indoor operations pay large sums for electricity to flower plants under controlled conditions. The market supports the price point at this time, but that may change if sun-grown cannabis comes into fashion with general consumers as it has with connoisseurs. 2. Freshness (5 / 5). The freshest buds are the best, so since the soonest a producer can get high-quality buds to the retailer is 1 month, a sample being evaluated at 1 month is often at its best. Most of our field ratings will take place at exactly 1 month after harvest as producers are packaging the product. Sample was 12 months old and appeared as fresh and fragrant as any 1-month sample, thus 5 points. 3. Terpenoids quantified on the Label (4 / 5). Label has no more than one error or inaccuracy; terpenoids are qualitatively on the label, but less than five terpenoids are individually quantified. See the terpenoid profile bar graph produced by Jeff Cole in the Seattle Bliss video review . 4. Producer uses no pesticides (5 / 5), holds current certification or passes our inspection, and states this claim (e.g. “No Pesticides Used”) on the package label. 5. Grower has hosted or welcomes a future HigherGround420 tour and inspection (5 / 5). All producers are given benefit of doubt until decided otherwise. This means every grower gets these 5-points until we decide at our sole discretion that the points are not deserved. A brief tour demonstrates compliance with laws and improves consumer confidence. 6. Cannabinoids Labeling, one quantity missing; (4 / 5). While it is apparent to a trained individual that Total THC in this case is equal to Total Cannabinoids (appearing as I-502 Total here), the average consumer wants to know Total THC. For the sake of clarity to the consumer (not just what the law requires), a perfect five out of five would indicate a very informative label that has no less than ALL FOUR of the following: 1) CBD, CBD-A, or Total CBD, 2) THC or THC-A, 3) Total THC, and 4) Total Cannabinoids (four items: CBD, THC, Total THC, and Total Cannabinoids) clearly and accurately quantified. CBG, CBN, etc. may be included on the label as a bonus. 7. Terpene Presence (5 / 5) is evaluated with the First Sniff and is indicative of Concentration as an undetectable sample would rate at 0 and a very strong one at 5. Standard sniff evaluation includes the combined sniffing of the newly opened container AND subsequent grinding of 1 gram and sniffing the freshly-ground product. This step is for evaluating the whole buds in the newly opened container. The original 1g sample in this case was inadequate for complete objectivity. A second sample of the same crop was purchased in a larger 3.5g size. As a result, future HigherGround420 evaluations nationwide will be standardized upon the 3.5g package size. Sample DT01 at 400X magnification. 16. Smoke Terpene Presence, 1st, 2nd taste (5 / 5). Sample was rated only upon how fragrant the smoke was; not how well it was liked, though it was most delicious. 19. Effectiveness (5 / 5). Dutch Treat being a THC strain with no CBD was quite effective. A rating of five in this case indicates a high potency. 20. Price-Value Rating (PVR), (0 / 5). PVR is calculated based on the price per gram versus the calculated average price regardless of potency. As is the case with this sample, those equal or above the average price earn 0. Those under the average are scored according to the richness of the value. This sample earned an overall rating of 87 out of 100 possible points. Outdoor cannabis operations, greenhouse grows and those with light-deprivation greenhouses impose a much smaller carbon footprint on the Earth. This indoor operation could earn up to 5 points on the HigherGround420 scale for better Earth Stewardship. The Producer could also easily satisfy the consumer’s desire to know exactly what they are consuming by proactively printing an annually verified terpenoid profile on their package label to earn another 5 points. Also, other states have other requirements, but Washington Liquor and Cannabis Board (LCB) rules state ALL FOUR of the following are required: “THC concentration (delta-9 tetrahydrocannabinol) listed as total THC and activated THC-A and CBD concentration (cannabidiol) listed as total CBD and activated CBD-A” (WSLCB rules, https://apps.leg.wa.gov/wac/default.aspx?cite=314-55-105 WAC Section 2, a, iv, E). NOTE: The WSLCB rules have errors. Activated THC-A is THC, and activated CBD-A is CBD. When transcribing these values from the lab report onto your label it is best to transcribe each exactly as the lab has it listed. THC is activated THC, THC-A is the non-activated, acid form of THC, and so on with CBD.